I had been planning on meeting a couple of girlfriends for afternoon cocktails but one of them had been a bit under the weather so we rescheduled, but then I got invited to join other friends who were going to the same venue. 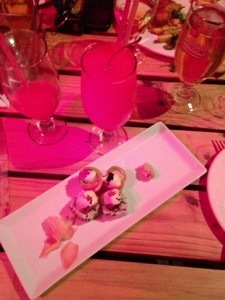 We went to the new bar/restaurant Re:Public. I had bought my daughters’ a hair roller and asked Lily to roll mine, I loved how it turned out, it made me look like I have a ton of hair! I hadn’t realized only girls were going out and I took Norm along, only to have to give him the boot. Oops! 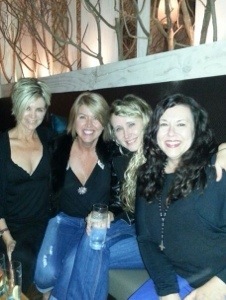 We had a few giggles as well as a few drinks…. 3 of us had the fillet and it was a gorgeous cut of meat. Very tender. As was my head the next morning after all of those vodkas, so not very happy when Norm dragged me out to the bank at 10am. Our deal was he had to treat me to Eggs Benedict. So true to his word we went to Greens in Constantia after the bank. It was delicious. It came with your choice of bacon, ham or spinach. We both opted for the gypsy ham. 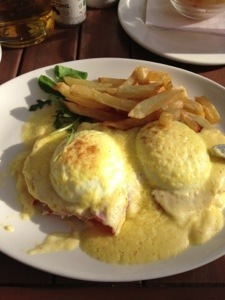 Their hollandaise is delicious. I saw on Face Book that The Lookout Deck was having a half price sushi and cocktail special that evening so I went home for a cheeky afternoon siesta. Then Lily, Josh Norman and I headed down to the harbour. It turned out that they also had the rugby on so Josh was happy. And they had a band on, so Lily and I had something to amuse us. Isn’t my daughter a beauty? They had the gas heaters going and it felt rather cosy despite the cold weather. You can’t beat strawberry daiquiris and mojitos for half price. Yumm. Add in fresh sushi and it is heaven. Norm had some beautiful fish and chips, it was both crispy and juicy. Josh had a basket of calamari rings and chips. 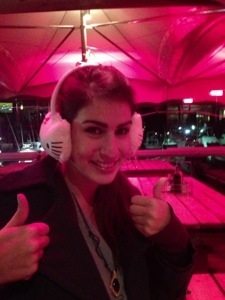 Lily spotted the lady who supposedly collects for charity and sales a load of tat and insisted on Hello Kitty earmuffs. Add this to half price cocktails and this makes for a lot of silliness. 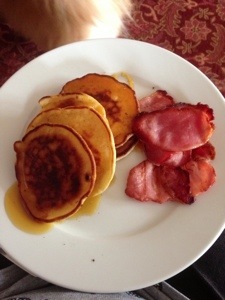 This morning we all had a long lazy morning lying in bed, then Lily and I made pancakes and bacon for brunch. 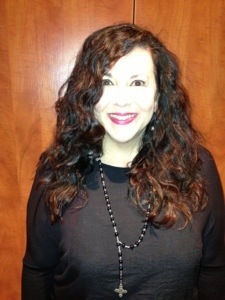 I have had a fabulous weekend. My accent can be a real mishmash of the various influences in my life. There are some words which have been phased out of my vocabulary – like ‘ain’t’ or saying ‘good’ in place of ‘well’, i.e. saying “He did good” vs “He did well’. Some of those things really bug me now but I would never have changed the way I speak if I had stayed in Georgia. One phrase which my ear always picks up on after I say it is ‘Come On’. In Georgian that sounds like ‘Moan’ with all of the letters all mashed up together like gravy and biscuits. I know the concept of ‘gravy and biscuits’ will have most of you scratching your head at the insanity. But to us Georgia girls a biscuit is not a cookie – it is like a savoury scone type thing. And the gravy is not the equivalent of Bisto – it is made from a roux created in the leftover bacon grease which sounds a bit gross but it is delicious. (And deadly probably but all good things are bad for us, right?) You can also make it from your leftover sausage grease – and to us southerners sausage is not always shaped like a sausage. To me the best sausage comes in a roll like ready-made cookie dough, and you slice it off and fry a patty of it. And if bits of the sausage end up being incorporated into the gravy, then all the better. Here is an image I blatantly stole from the interwebs to show you what I mean. When I first meet people they sometimes have a hard time placing my accent. To me, I find this funny as I feel like I sound soooo American. But then I hear myself pronounce certain words and I can see why it can be confusing. I often soften my ‘R’ – as in the American ‘Waterrr’ is pronounced ‘Watah’ here or no one can understand what I am saying. Sometimes I even struggle to remember what word applies to which country. For example is it ‘rubbish’ or ‘garbage’ or do I ‘pop it in the bin’? And that example from above – is it a ‘cookie’ or a ‘biscuit’? Is a biscuit a ‘scone’ or a ‘cookie’? I think I just created a referential integrity conflict. In our house we have American, Scottish, South African and a hybrid of these all chirping away, often all at the same time. We quite often take the mickey out of Norman and his scots words – like ‘book’ (poronounced ‘booooohk’ or ‘toys’ pronounced ‘tays’). Living in SA there are so many varied accents around us and we sometimes struggle to understand some of them. 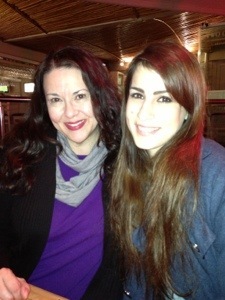 But I love that I have been lucky enough to experience so many different accents, cultures and lifestyles. Yes the crime is on the up – yes our lives are ruled by this at the moment – but I love Africa. I love the spirit of the people who all live here. We all take a little of everywhere we have been with us when we move to the next place. It is what makes us grow. Our household have joined the Hout Bay Neighbourhood Watch (HBNW) in an attempt to help our village get to grips with the crime which has gone on a sudden upshoot. This has had both positive and somewhat of negative aspects to it. The positive: direct access to everything happening in your area, awareness of any potential dodgy characters which have been seen in the area, a stronge sense of community and a feeling of empowerment. The negative: direct access to everything happening in your area, awareness of any potential dodgy characters which have been seen in the area, inability to pretend you live in a land of rainbows and unicorns as well as a radio buzzing at your side constantly, waking you up…am sure you get the idea. The newest thing to adjust to is my husband shooting off when there is any sign of trouble. Unarmed, unprotected and vulnerable. This happened today when he got an alert there is a break-in in progress a few blocks away. I was really worried about him, you never know what you are going to arrive to see or what you may run into. I started to get a feeling of resentment that I am worried because my husband is out looking after other people. 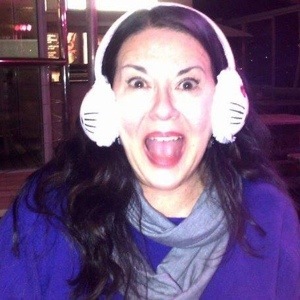 But then I had a bit of a wake up call and got to grips with my sense of privilege – how can I expect HBNW to look out for me and yet I am not willing to do the same for others? I am so thankful to the men and women who work tirelessly for the HBNW, who get so little sleep, who live on full scale alert, who jump to run and protect their neighbours. I have been on the receiving end of this protection, the night of our first break in we had so much support from them. Even people calling in the next day to check up on us. Now is the time to pay it back. It is time to take back our village, to clamp down on these bastards who are wreaking terror on our community. The only way to do this is as a united front – together. 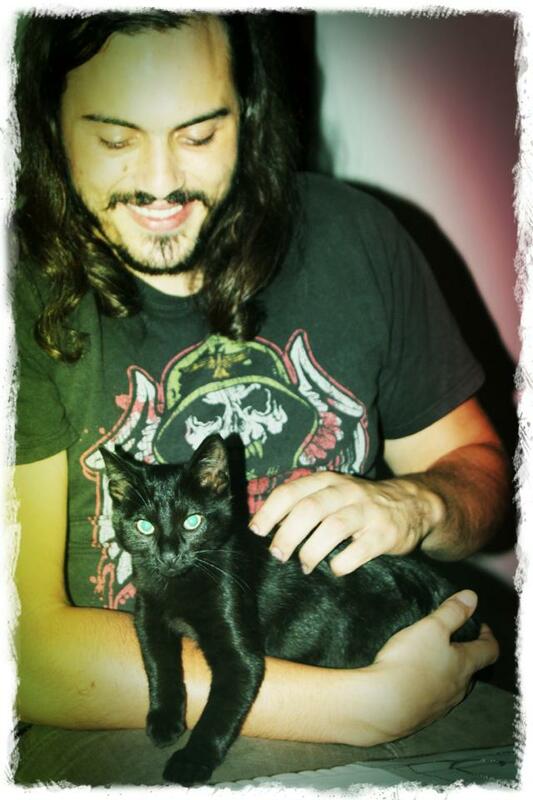 Last week was my son Trevor’s 27th birthday. I still get surprised when I realise I have ‘children’ so old. How did that happen? Trevor and his girlfriend Amber arrived down to visit us on Wednesday which meant I had several days with them and I was so excited! I have not spent Trevor’s actual birthday with him in so many years I cannot remember when it last was. We tend to dine at home for family birthdays and the birthday person gets to pick what meal and what cake we have. Amber had made some carrot cake cupcakes already so Trevor opted for chocolate fudge. The girls and I then made a mexican feast for the birthday boy. Caitlin made home made chilli poppers, and I made enchiladas with home made sauce, and we all helped to make tacos and burritos. It was yummy if I say so myself 🙂 Trevor got lots of cool pressies and seemed very happy with our choices. Trevor is such a sweet, handsome young man, and I am just so proud of him. I sometimes look at him and just see my Father – the older he gets the more he resembles my dad. It is sometimes quite uncanny! As the weekend progressed I felt my throat starting to itch and my eyes started to water and I just got worse and worse. We had all planned a visit to the HB Harbour Market on Friday as Trevor and Amber had never been, but I just was not up to it. Instead Norman and I just got some take outs and stayed in to watch a movie. It made me happy that all of my kids and their partners were out together. I love that they are friends and enjoy spending time together. To me there is nothing worse than siblings who have nothing in common, and cannot be friends. As I have no siblings myself I find that hard to understand. Saturday night was a friend’s birthday at La Mouette which is one of my favourite venues and I had been looking forward to it all week, but by that evening I could barely sit up much less go out and function. Norman phoned Tony the birthday boy and gave our apologies but I felt so bad as I am generally a reliable sort. if I say I am coming to something I will be there. The trend in Cape Town is to play it by ear and show or not show depending on their mood of the moment or whatever better offer they get! That annoys the hell out of me! Trevor, Amber and Caitlin all went off to the other side of town to visit some friends and Lily and Josh chilled out at home with us. Yesterday was a day of relaxing for all. I made a big pot roast and we all just chilled out and relaxed. Tonight is a Neighbourhood Watch meeting for the new people to get to know each other. I had been looking forward to meeting some of the voices I hear on the radio and chat with online but I am still not up to it. Norman will have to represent our household in this meeting….maybe it is best if they get to know the calm, rational spouse before they meet the noisy one?? Yesterday I had a “Duck Dynasty” marathon and watched all of series 1 and 2. I am addicted to this show. I wanna be a Robertson. But one of the guys, not the wives. The wives just seem to mill about looking pretty while the men have all the fun. And I’d never have to wax again. Any part of me. Ever. The one thing repulsive on that show is when they eat squirrels. Apparently rednecks do this. I have to say maybe it is just Georgian rednecks who abstained but I never ate a squirrel. I wonder if my Grandma ate them? When I told Caitlin I have eaten frogs legs she was a bit repulsed. But they are nice! It may help in this balance of views that I hate frogs and love squirrels (as animals not to eat). One of the pieces of advice the Grandfather in Duck Dynasty gave his Grandson was to try and find a woman who could cook better than his mother as Mama’s cooking is always the best to a man. What do I remember my Grandma cooking? Big pots of pinto beans with fatback, served with chopped onions and cornbread. Big platters of fried chicken, crispy outside and soft inside. Fried potatoes with onions, fried green tomatoes…and there lies why I seldom make these things is the health risk. But they still remind me of growing up in Georgia. When Norm and I were out for the dinner at Pure we reminisced about one of the best meals we had ever eaten. We were living in the UK and had flown to Pisa for a long weekend over Valentines Day. We had been sight seeing all day and wanted something nice to eat so we decided to just follow some local Italians who looked like they had good taste. We picked a stylish couple and just started following them, just far enough back so that we didn’t look like pickpockets. They ducked down a side street you wouldn’t know existed if you were not a local. They entered a tiny little stone building with a small sign all in Italian and joined a big party of people celebrating. We went in and the maitre de asked if we had reservations and we said no. He said the kitchen was closing as there was a private party on but if we were happy with whatever the chef had in the kitchen we could eat. Thank goodness I had lived out of the US long enough I had been weaned of my ‘sauce on the side and this instead of that’ mentality and just accepted what life presented to me. 1st we were served a light salad with Parmesan shavings and Parma ham with some gorgeous bread and butter. We were then given a huge steaming bowl of seafood risotto. It was so creamy and the tastes of the sea were just light enough to not overpower you. It was just the most divine meal. Sometimes when you let the universe be in charge what you are given can surmount even your highest expectations. Last night when our domestic Cordelia finished work we drove her home through the township. It was dark and to be honest I was terrified! I started getting annoyed with Norm for taking the risk of driving through at night and then I started to think about how I would feel if I was Cordelia with a pocket full of cash trying to get to my home. The crime within the township is sometimes worse than the crime in the more affluent suburbs. Cordelia then said to us that a tsotsi had been murdered near the cemetery last week. We asked why and she said that his own ‘gang’ killed him. She said that they worked together committing crime and maybe the one who was murdered was not doing the splitting of the bounty properly. Norm’s response was ‘well that is one less to contend with’ which sounds heartless but as I said before – we are hardened. After we dropped Cordelia we then made our way slowly out of the township as it is so dark that you can see nothing. Our biggest fear is hitting a child who is playing in the streets. the trauma of that would be unbearable, but not only that, there is the risk that we would probably be pulled from the car and killed. I’ve heard of people killed for hitting someone’s livestock so can’t imagine what it would be like with vengeance for a child. 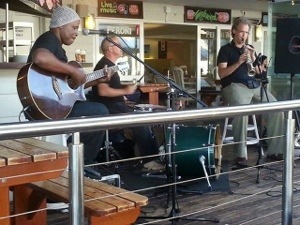 We then headed off to the event at Pure Restaurant at Hout Bay Manor. 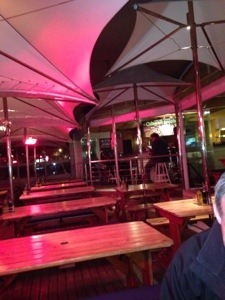 The restaurant was fully booked which made for a nice buzz. We were greeted with a big glass of merlot from La Bri Wines. As I do not drink red Norm shuffled off to find some white. We then snuggled up by the roaring fire and enjoyed the atmosphere. We went through to be seated and discovered a cheesy lounge singer. I have a love hate relationship with lounge singers in that I either love them or hate them. I loved this guy. He sang loads of my fave cheese tunes and I happily sang quietly to myself between chewing. 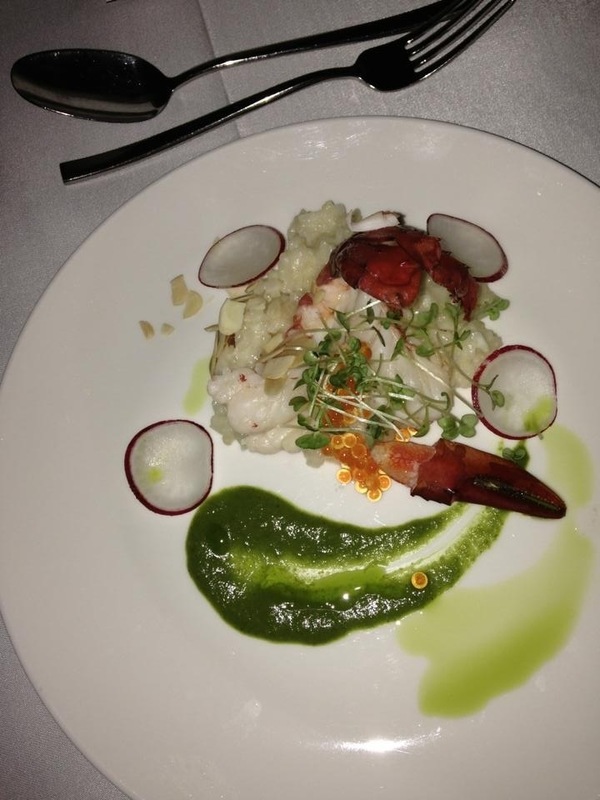 The 2nd course was poached marron crayfish tails on lemon and almond risotto served with parsley purée and crowned with micro herbs and red radish shavings. This was paired with La Bri Chardonnay. This dish was beautiful enough to make you weep. The risotto was cooked to perfection. The crispy almond, the slightly bitter radish and the richness of the crayfish was just so gorgeous. My favorite dish of the night. The Chardonnay was a bit oaky for me but Norman enjoyed his. 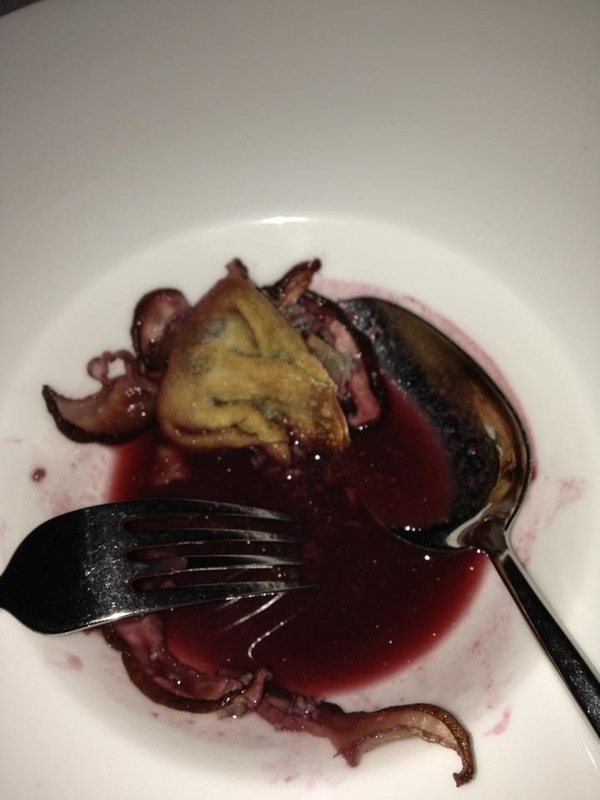 The next course was a really odd one. 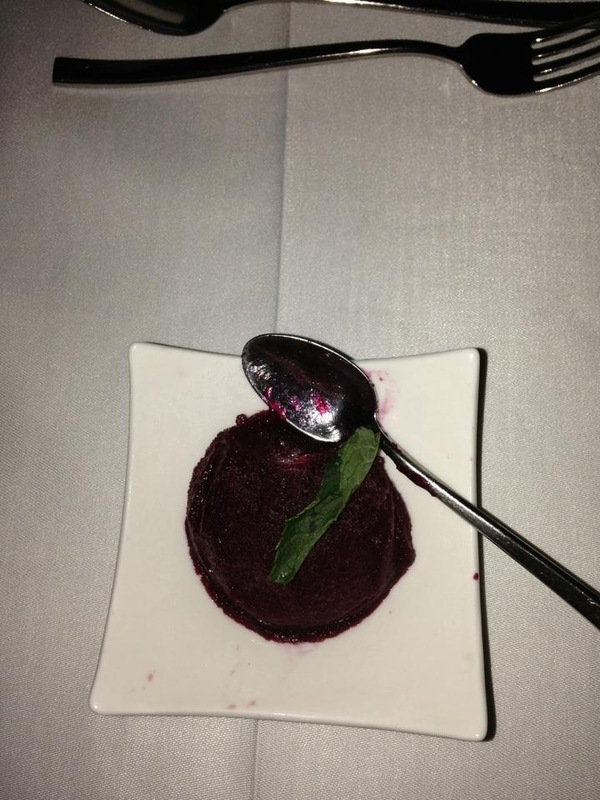 It was a beet root and balsamic sorbet. I would never imagine either of these individual items as sorbet much less the two combined. But it was very refreshing and had a lovely taste. The next course was a fillet of roasted blue wildebeest loin. Yes I said wildebeest. Remember this is Africa. 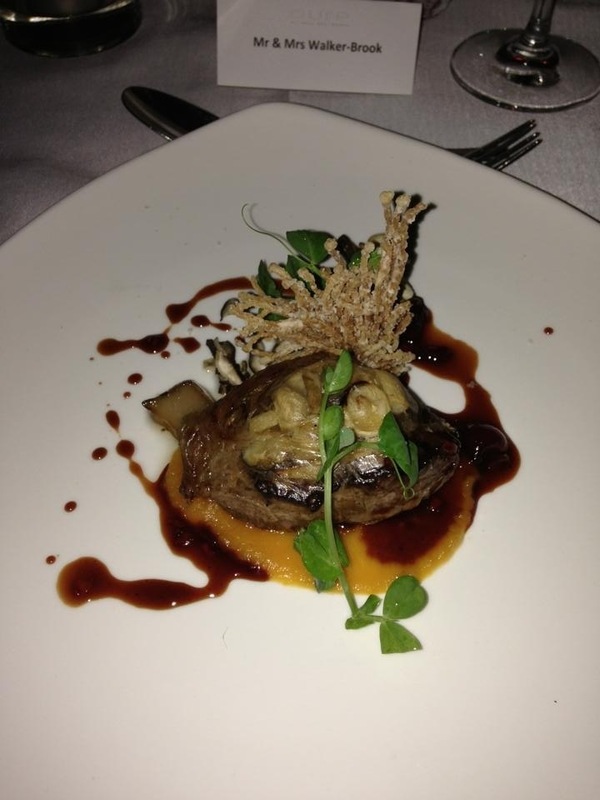 It was served with butternut purée and smoked bone marrow accompanied by exotic mushrooms and cassis jus. This was ….. interesting. 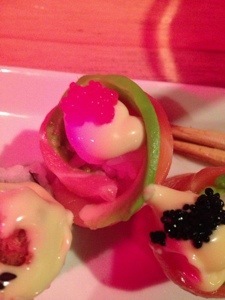 The flavors of the various things on the plate complimented each other beautifully. Norm was rather unlucky and his piece was full of gristle but mine was as tender as any other steak- it was just a bit gamey for me. But that is the nice thing about a 5 course meal if one isn’t your cuppa tea you just move on to the next. 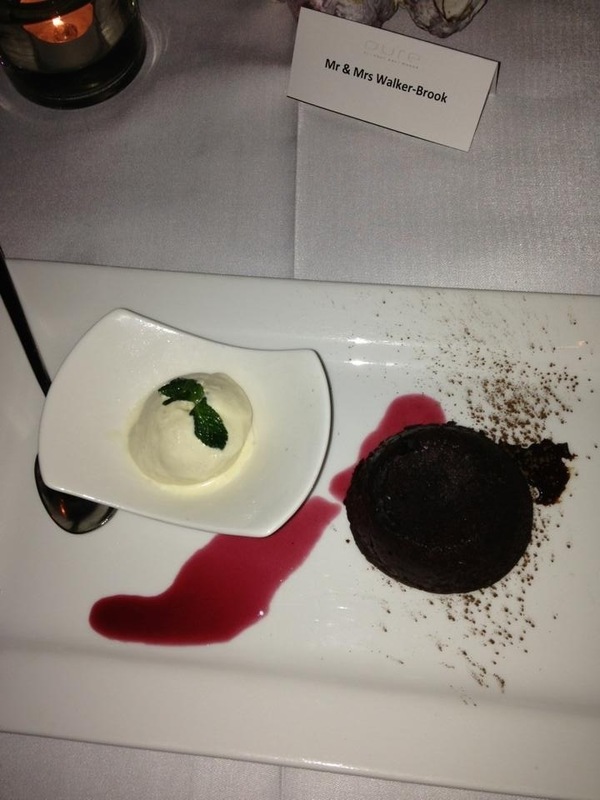 This just leaves the finale of warm dark chocolate fondant served with hazelnut ice cream. Oooooh, heavenly! The thick warm chocolate oozing from the centre was divine and the hazelnut ice cream was the perfect accompaniment for it. One of the cool points of the evening was meeting some of the people I chat to in Hout Bay Organised, a local HB Facebook group and we recognized each other from our profile pics. We used Home Heroes to get home after all that wine. 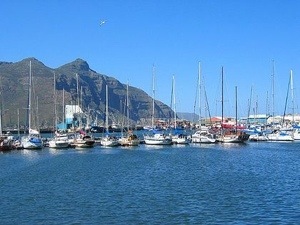 Even with all the drama, I do love Hout Bay.